Looking for some serious finger-pocket climbing? The Fränkische Schweiz starts just about 20 mins off Nürnberg in Germany. 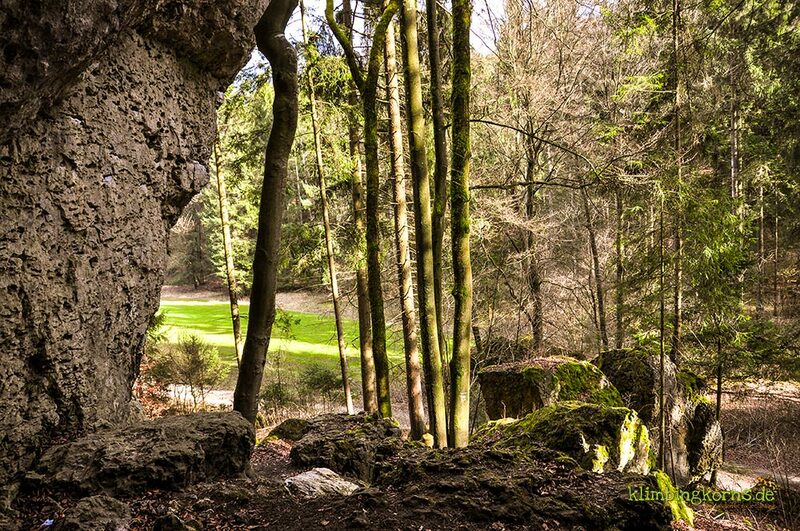 Also known as Frankenjura locally, this region is covered with thick green forests in summer, soft hilly landscapes, private beer breweries and climbing walls hidden in every corner. It’s where elites like Seeger or Megos grew up strong and conquered and where the Red Point was born. 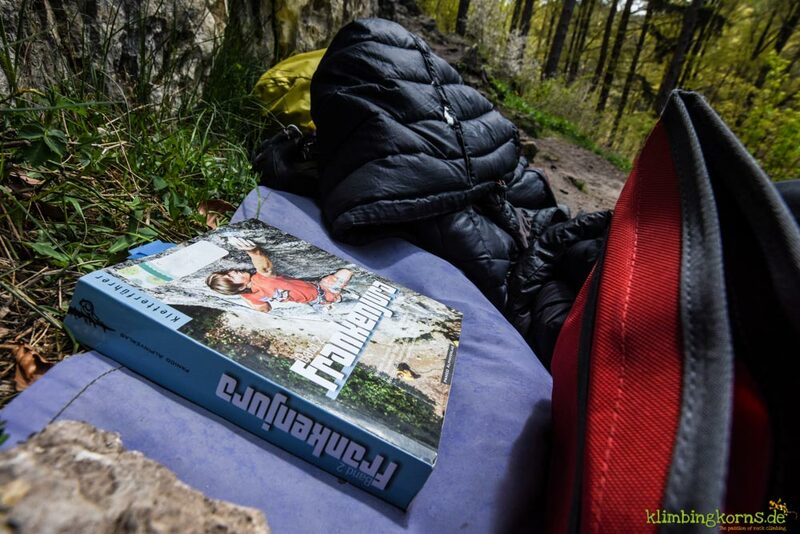 Sebastian Schwertner, the author of the climbing guidebook Frankenjura Band 2, documents all his findings in 2 volumes, each with >544 pages, almost a kilogram in weight. New editions pops out frequently, a special package of both volumes and a topographic card will be out in Spring real soon. The 2 volumes are divided into the northern and southern part of Northern Frankenjura. The 2. volume lists crags in Walberla,Trubachtal,Betzensteiner region,Spieser region,Schnaittacher region, Sittenbachtal, Pegnitztal, Krottenseer Forst, Hirschbachtal, Schwarzer Brand, Königsteiner region, Lehental, Högenbach- and Förrenbachtal,Lauterachtal. All of which lies in the southern part of the Fränkische Schweiz. One thing about climbing in Frankenjura is you will be climbing in a maze of little sectors spreaded out in the forest region. If for some reason the wall does not appeal to you, or it’s too crowded, etc, it’s easy to find another alternative. (i.e. you don’t have to drive 200 km to find another crag) If you’re climbing out in a group with entry and advance levels you could divide your day in half – first, look up for a crag with entry level routes, and then change to climb on harder routes. Not always will you find sufficient grades (easy and hard) in one wall. But with so many walls around you – just make your pick. (and keep everyone happy) To do this, it’s an advantage to be able to drive around. Every time I think about Hirschbachtal I keep thinking about all the projects that are waiting for me. Norisbrettl, Castelwand, Starenfels are just some of the walls that are quickly crowded when perfect condition calls. 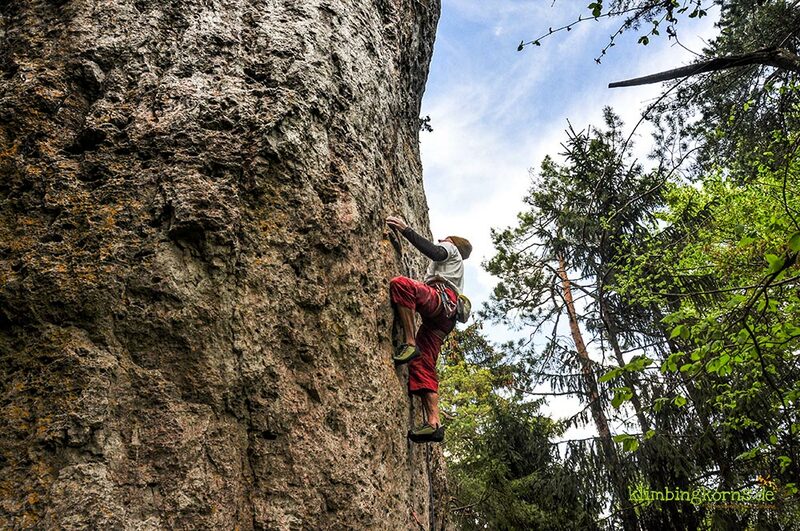 Große Wacht or the Algersdorferwand in a parallel valley has some awesome routes ranging between the 8s and 9s. The Riglashofer Turm lays in a quiet valley. With the guidebook, use the overview to look up all the crags that are nearby. You could hop on to the next project once you have ticked off your present one. After a climbing day, look up again on the overview map for hints on places to eat. I find the trouts and beer at one of the guesthouses in Hirschbach a great place to chill off the day. Trubachtal gives you an impression that you could park your car in the beginning of the valley and walk through all the walls. 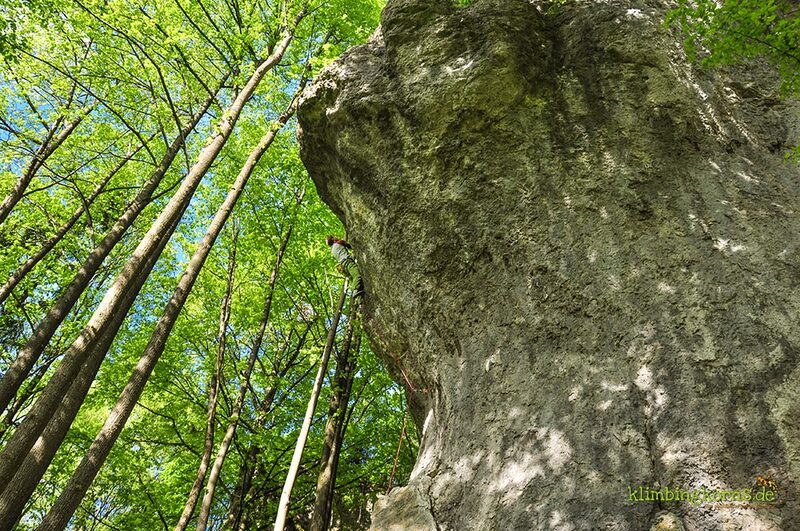 (But climbers ain’t usually the hiker… so forget that) Classic destinations like the Richard Wagner Fels, Zehnerstein, Bleisteine lines up next to each other. Many will come here because of Kurt Albert’s “Fight Gravity” 8+ or “Magnet” 9. A brief history of the area and a description of the type of climbing in the overview gives you an idea what to expect. A typical franconian pockety wall, is the Hetzendorfer Wand. I was first there in 1999. 17 years later, we came back to find a few more new routes, new sign posts and comments like “I can’t even remember how this wall looks like” and “wow, what a nice setting” . It’s a typical wall full of holes for plaisir climbers comfortable in UIAA 7-8. The walls lay right on a forest track, reached after a short walk from the parking lot in 10 mins. I discovered a few new lines that were not listed in the book. It must’ve been new. The franconians never sleep. There’s always something new. The guidebook, in volume 1 and 2, lists all routes that are available in Frankenjura. As mentioned on an earlier post on Volume 1, this book is a great and reliable resource for a trip into Frankenjura. Inspiring photos taken by local photographers help give you impressions of the areas. The book is written in german. No translations available. The topos are clear, the access description precise. 342 ++ sectors (in vol 2) to choose from is a difficult task for someone who has never been here before, given little time and experience. Even as someone who has seen quite a bit of the region over the years, I can’t ever remember the name of the wall or valley I have been to. Where should you start? Where to find a wall with a density of certain grades? Which wall is good for winter? Which wall is good on rainy days? We end up still calling local friends for suggestions, because it’s hard to pick out the sweetest berries from the bushes. Isn’t it easier to filter a search for the crag according to season, grades, region/area/ town, length, bolting, bird bans, than to search them painfully in a bible of 1000 pages? You’ve heard my biggest wish for the next Christmas. Why not makeover the digital to work with every printed version? Update 07.2016: With the newest edition (10th) that came out in April this year, each book comes with a free download code that gives you access to the Topos on your Smartphones (IOS /Android). Yayy! Check out the Vertical-Life App.